Where can I buy Yvonne's Art in person??? Classes are all inclusive- meaning they include all the equipment needed, glass used, torch time, safety goggles, and annealing. Annealing means that I will be putting your finished glass pieces in a kiln to ensure the integrity of the glass, and that requires you to pick them up at a later date. Annealing is important - thermal shock is less likely to happen and it promotes strength & longevity in your work. Everything can also be mailed, there is a $7 fee for shipping and handling. You will need to dress in cotton clothing and it should be clothing that you don't care about. Sometimes the glass pops and little bits may land on your clothing and burn it. Long sleeves are a good idea. The studio tends to be cool, but the torch and kiln heat things up quickly. Long hair should be tied back. I am very generous with glass selection- I don't want to inhibit your creativity, but at the same time, certain glasses have chemical reactions with other glasses and I try to lead you away from things that will end up turning smoky, snooty grey and yucky! One thing I am stingy on sharing- I give out only some purples & no pink- these colors are very difficult to work with for the beginner and they cost 10+ times more than most colors (the people who manufacture it ALSO have a hard time making it- hence their losses are included in the cost!) I have A LOT of glass. So no worries, still more colors to choose from then you'll be able to use in one class! REMEMBER- This is fun! I've learned that some people's expectations aren't realistic and they are too hard on themselves! Keep fun in mind and relax and you will make something with which you will be proud! Most people walk away with at least 4 or 5 beads that they like- depending on which class they take. Some people walk away with 10 to 12 beads. I try to have a 5 min break for every hour- to stretch, eat carrots ( I usually have a simple munchie available) and take bathroom breaks. I recommend the 2 or 3 hour class. The one hour is a tease! Glass is an expensive art form and I try to accommodate those with smaller budgets by offering the one hour class and also by offering that people team up. I frequently will teach the longer class with two students sharing the time, the torch and the expense! If possible, start spinning pencils with your fingers- both hands. 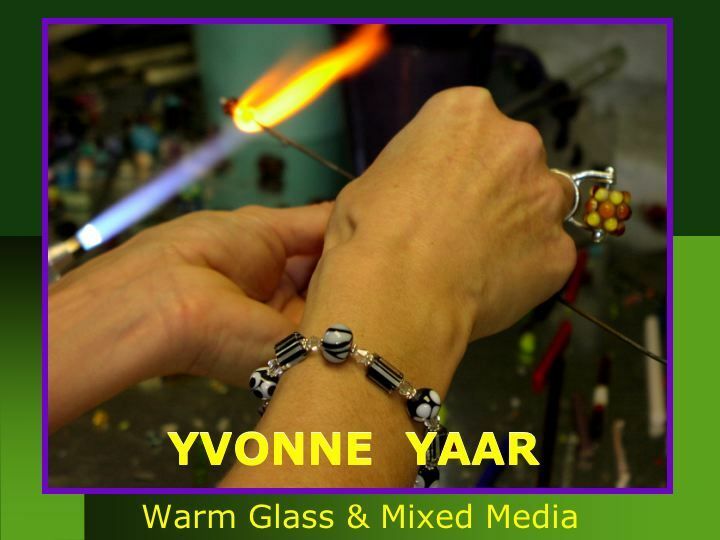 When you make beads in front of a torch, you hold a mandrel parallel to the work bench and the glass gets put on the mandrel. While the glass falls onto the mandrel, you slowly spin it with your fingers. As you add more glass, you will be spinning the mandrels and the glass rods in the flame of the torch to keep them warm and to prevent thermal shock. It helps to practice a little- remember- do it with both hands.